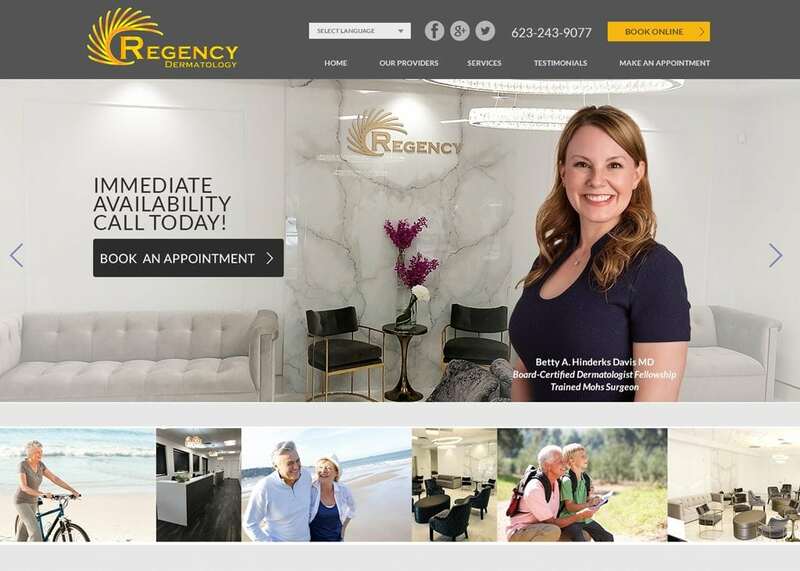 Regency Dermatology presents itself as a high-end dermatological clinic with a goal of providing kind, friendly treatments for the most concerning needs. From the moment you come to this website you start by being introduced to the staff that will be taking care of your dermatological concerns along with an invitation to call for an appointment right away. This presentation lets you know they’re already ready to serve you, they even offer a convenient online booking option if you’re on the go! This website wants you to know that the staff is ready to serve you and that they have a comfortable office setting to help enhance the self-indulgence of the visit. Images are present showing you what a brighter future it can be if you no longer have to face the dermatological needs that concern you. Their images reflect their target audience, those getting on in their years who still want to spend time in the sun without concern for their appearance or health. The color tones are very subtle on this website, a combination of beige, grays, and a splash of mild orange coming together to present the company’s total image. The beige and gray represent sensations of reliability and confidence, along with a subtle subtext of authority and comfort from the gray. These tones also tend to suggest a non-assuming and steady presence with a no-nonsense approach, showing that Regency Dermatology won’t take you on flights of fancy or suggest trivial treatments, instead, they’re going to get down to business and take care of what you need. Throughout the website, there are hints of the personality of the company you’re going to be getting treatment from. Everything on the website is in motion, suggesting an inherent energy to the people who work there while also giving a sense of industry and elegance. Visitors are encouraged to start making appointments and getting into the office, but the website is quick to provide information about the services they offer. This indicates they are serving a knowledgeable and interested clientele who are looking to get in, get their treatment done, and get out. Immediate access to the phone number and the convenience of an online booking system are two things that really speak highly of this website’s dedication to serving their clients’ needs. The presence of the social media links at the top of the home page directs you to get in contact and stay in contact with the clinic, making it part of your standard circle in the world. The image presented on this website is one of reliability and a lack of nonsense, something bound to be attractive to an older clientele. The various elements ensure that the website has SEO value, but it also focuses on showing a comfortable venue and the hopes of what they could be through the slide-show. Welcoming and professional this website indicates this clinic can help you with all your concerns regarding your dermatological needs.